These breaks aren’t random—they happen in certain predictable circumstances. And more importantly, the consequences of these accidents are far from random. In fact, damaged phones have measurable effects on our careers—and even our love lives—as we discovered in our latest research. You’re already familiar with car safety—seat belts, speed limits, fighting the urge to imitate The Fast and the Furious—that kind of thing. What you may not realize is that cars are actually quite dangerous for cell phones. Getting into and out of cars is the #1 most dangerous situation for our phones. In fact, 34% of broken phones have been damaged that way. Another 25% of phone damage occurs at work which is perhaps not so surprising given how much of our day is spent on the job. Even the bathroom isn’t safe for the 20% of people who have damaged a phone that way. Certain individuals and settings are also associated with increased risks of phone damage. 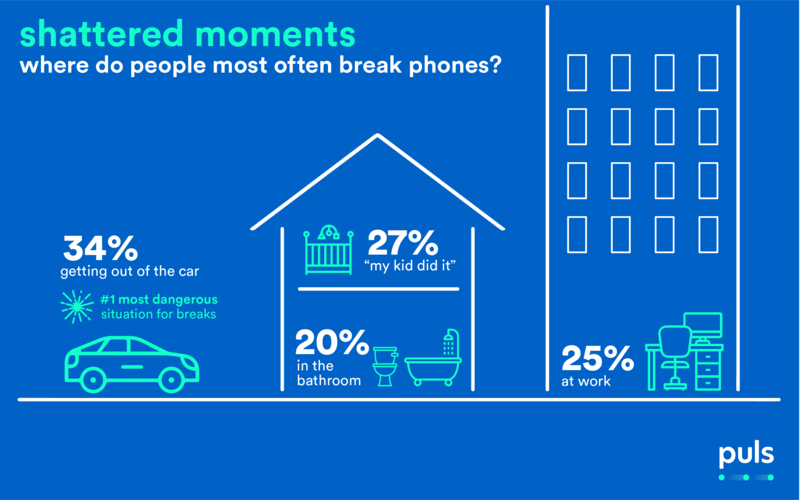 As any parent knows, your little bundle of joy is a major threat to your gadgets - nearly one in three parents (27%) have had a device broken by their child. Our previous research showed that men are slightly more prone to breaking a device, particularly when at the bar. Men are nearly twice as likely to report breaking their phones in a bar (11% of men; 6% of women). While having a working phone isn’t typically a relationship deal breaker, we also found that broken phones also impact one’s romantic life. In fact, for those looking to impress on a first date, fixing up your device beforehand may be well worth it. 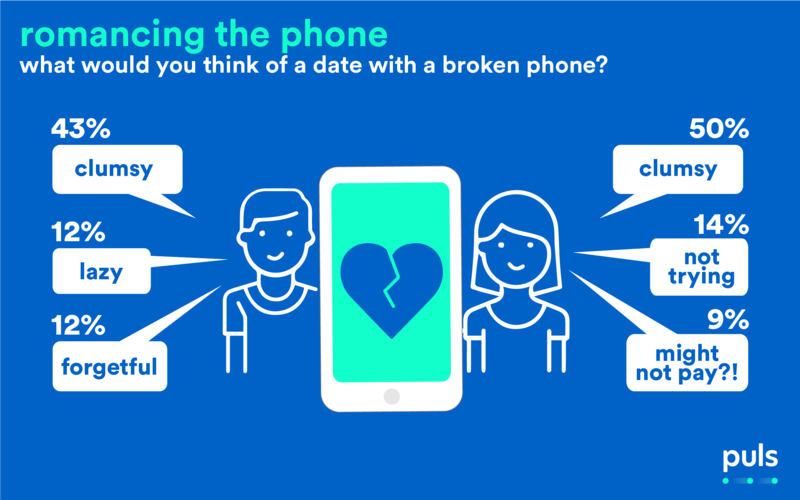 Women take a slightly harsher view of a date with a broken phone than men do. But no one gets out unscathed: large numbers of people find it a sign of clumsiness, or worse—laziness. Is it “fair” that daters hold these biases? Perhaps not. Who among us hasn’t broken their phone in a legitimate accident—at exactly the wrong time? On the other hand, you can’t blame single people for vigilance. It’s a jungle out there. In an era when people ask each other for their credit scores on dating apps, at least a broken phone is something you can fix in a short time. Especially if you use Puls. Romance isn’t the only big, life-impacting area affected by cell phone damage. 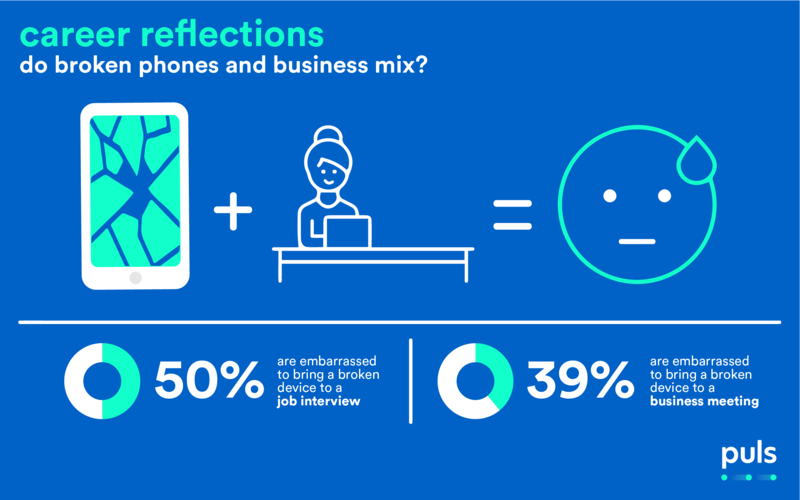 50% of people are embarrassed to go on a job interview with a broken phone. When you’ve spent three hours assembling that hire-me-now outfit, you need every detail to be perfect—and so far, fashion hasn’t produced a single ensemble that goes with a shattered screen. Current job holders are almost equally as uncomfortable revealing a broken phone at work. 39% say they’d be embarrassed to bring their busted phone to a business meeting. Quite reasonably, most people in our survey want the fix right away—67% within a few days, and 37% immediately. In the meantime, 10% report having hidden a broken phone in public. Oof. Strangely, many people do not realize how easy it is to fix a broken phone—and end up suffering through the shame. A mere 3% claimed they would hold out for months or longer. 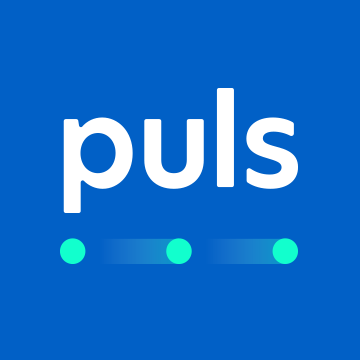 At Puls, we’re here to tell you: waiting to get your cell phone fixed—and therefore facing the horrorshow of awkwardness and poor impressions described above—is completely unnecessary. We live in an always-on world; everyone from kids to grandparents rely on their phones day-in and day-out. We’re becoming accustomed to instant satisfaction with on-demand delivery services for ride-sharing and groceries—so why not for something as important as the heart of your digital life? 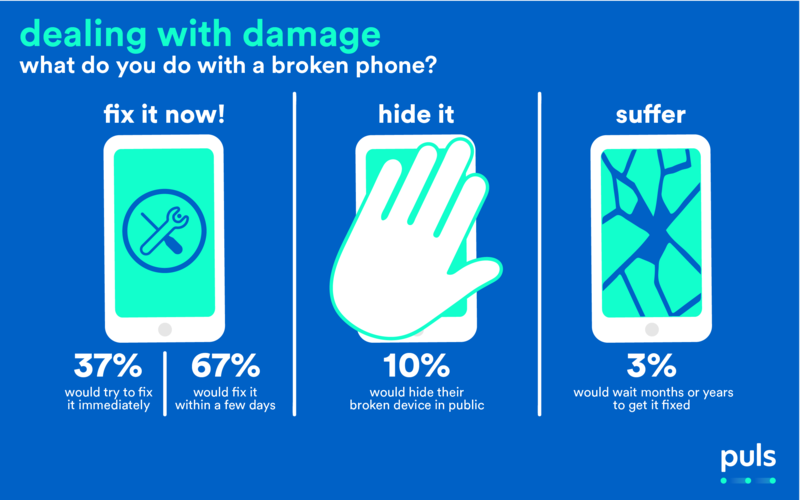 Our survey confirms: most people want—or need—their phone fixed right away. And we’re here for them. We’ve made getting your phone fixed effortless: that’s literally the reason we exist. There’s no reason to wait in line or drive across town. Our expert technicians can be at your home, office, or nearby cafe in less than an hour to fix your cell phone—and who knows, very possibly save your dating life. Not that you need any help in that area.